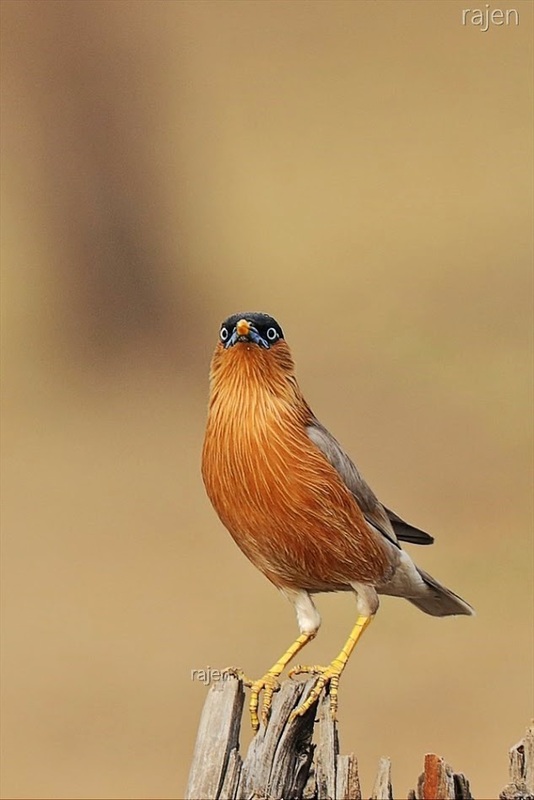 The Brahminy myna or Brahminy starling (Sturnia pagodarum) is a member of the starling family of birds. It is usually seen in pairs or small flocks in open habitats on the plains of the Indian subcontinent.This myna is pale buff creamy with a black cap and a loose crest. The bill is yellow with a bluish base. The iris is pale and there is a bluish patch of skin around the eye. The outer tail feathers have white and the black primaries of the wings do not have any white patches. The adult male has a more prominent crest than the female and also has longer neck hackles. Juveniles are duller and the cap is browner.The species name pagodarum is thought to be based on occurrence of the species on buildings and temple pagodas in southern India.